Google seems to be concerned with improving the user experience in Gmail and sometimes upgrading your browser can really speed up web applications like Gmail, especially when you are using Internet Explorer. 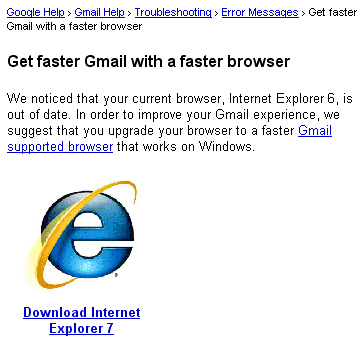 I happened to open Gmail in Internet Explorer 6 and I noticed a message that invited me to "get faster Gmail". Google didn't recommend to install Firefox or Chrome, like it did in other cases, but it suggested to install IE7. "We noticed that your current browser, Internet Explorer 6, is out of date. In order to improve your Gmail experience, we suggest that you upgrade your browser to a faster Gmail supported browser that works on Windows." Upgrading to Internet Explorer 7 is a good tip, but I was surprised to see that Google sends users to a customized version of IE7 that includes Google Toolbar and changes your homepage to google.com. Downloading additional toolbars should be optional and it has nothing to do with Gmail's performance. What's more, the customized package includes outdated versions of IE7 and Google Toolbar from 2006. A similar page from Gmail's help center explains that you can "make Gmail run an average of twice as fast" by installing IE7, Firefox 3 or Chrome. Google links to the official homepage of Mozilla Firefox, instead of recommending a customized version. "Downloading additional toolbars should be optional and it has nothing to do with Gmail's performance." I agree with you, I think Toolbars might slow the performance. Google shouldn't push products like Microsoft. It is almost impossible to keep the IE Google Toolbar off your machine these days: probably half the (unrelated) products include it by default - are you listening, Flash? - if you fail to pay attention for a second, it gets installed. My gmail quit loading all the way on firefox. It also won't load on IE it keeps hanging up while loading I have to go to Older version to make it work, then chat doesn't load. @Southern Sage: Update your browser. 2)Does it work when you replace the HTTP in the url with HTTPS? I can't say whether this has any material effect for GMail as I don't use IE at all but it's not completely true to say that toolbars can't positively affect performance. Joe has a good point. Google is soo stupid now. Just give option to user. Don't push user to use IE7 only. Give another alternative also !!! I think your criticism here is a bit unwarranted. By telling users who have chosen to use IE6, or are likely forced to or unaware of the options, to update their browser they are avoiding potential monopoly charges and simply helping those users. IE6/7 without the Google Toolbar is a joke anyway, searching is too integral to browsing the Web that having to go to a page to do it is just silly. Basically this is fine as Yahoo does provide customized IE with Yahoo Toolbar. However, Google had done a poor job on QA, as it shouldn't be difficult to set up an automatic or semi-automatic process in order to deliver a customized IE as soon as IE or Google Toolbar get updated. Hey, Google, won't you pay me a consultancy fee for establishing such process? Since upgrading to Safari 4 / Mac, I've experienced very slow and jammed Gmail. Offline gmail might be the cause also. In other news about Gmail: In an unusual reversal almost one month to the day since they removed it, Google has restored the Search the Web option to Gmail. Never let it be said that a respectful, organized, persistent, and mostly intelligent protest by subscribers won't make a difference. Big thanks, too, go to Scott Wilson (Google Gone Bonkers), Steve Rubel (Making Gmail Your Gateway to the Web), CNET, GetSatisfaction.com, Google Operating System, SearchEngineWatch, PLA Tech, and a host of other bloggers across the web who helped get the word out. Google links to the default Firefox download rather than a customized version because the default Firefox is fairly Google centric (default for search box is Google, default home page is a FF customized Google page). While it doesn't have everything the toolbar has, it has a fair amount. On the other hand, the default install of IE is very MSN centric. Criticism here is what Google needs. The toolbar might be great and all but a lot of people like me don't need the extra crap in their browser. I am suprised to see that Google doesn't pitch their browser or Firefox too. When you first setup IE7 it may default to Live but its very easy to change and your actually prompted to confirm that's what you want.